WASP-43b is the hot Jupiter that is closest to its parent star, around which it orbits in only 19 hours. At such a close location, tidal interactions between the planet and the star will be intense. That means that we expect the planet to be phase locked (with its rotation period equalling the orbital period, so that the same side always faces the star), and we expect the orbit to be circular (any eccentricity having been damped by tides), and we expect the orbit to be aligned with the rotation axis of the star. Tidal damping of the alignment of the orbit is the subject of much investigation. It seems to be most efficient if the planet orbits cooler stars, and much less efficient if the planet orbits a hotter star. This might be because cooler stars have large “convective zones” in their outer layers, which can efficiently dissipate tidal energy, whereas hotter stars have only very shallow convective zones with little mass in them. Since WASP-43b orbits a cool star, a K7 star with a surface temperature of only 4400 Kelvin, that’s another reason for expecting its orbit to be aligned. This has now been confirmed by observations with the Italian Telescopio Nazionale Galileo. The way to measure the orbital alignment of a transiting exoplanet is by the Rossiter–McLaughlin effect. As the planet transits a rotating star, it first obscures one limb and then the other, and since the different limbs will be either blue-shifted or red-shifted, according to how the star is spinning, the effect on the overall light of star will reveal the path of the orbit. A new paper by Esposito et al reports R–M measurements for three planets including WASP-43b. The data show the classic R–M signature of an aligned planet. The upper panel shows the change in stellar radial-velocity around the planet’s orbit, caused by the gravitational tug of the planet. 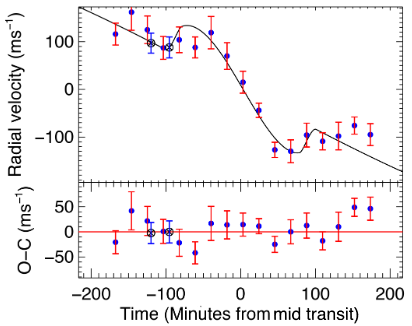 The lowest panel highlights the data through transit, showing the expected excursion first to a redder light (when blue-shifted light on the approaching limb is occulted) and then to blue light (when the red-shifted receding limb is occulted). 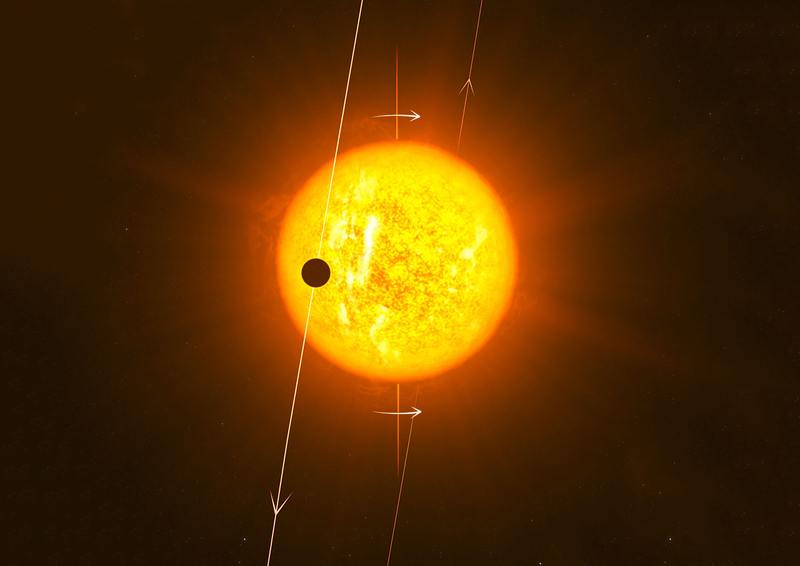 This entry was posted in Hot Jupiters, WASP planets and tagged orbital obliquity, Rossiter-McLaughlin effect, Telescopio Nazionale Galileo, tidal damping, WASP-43b on February 14, 2017 by waspplanets.